Italy: Rome, Piazza del Campidoglio. Record drawing of a free-standing trophy, possibly from the rear, showing a fur cloak with shoulder belt and capped head. It is flanked by the back shields and has more shields and armour at the base. You are here: CollectionsOnline / Italy: Rome, Piazza del Campidoglio. Record drawing of a free-standing trophy, possibly from the rear, showing a fur cloak with shoulder belt and capped head. It is flanked by the back shields and has more shields and armour at the base. 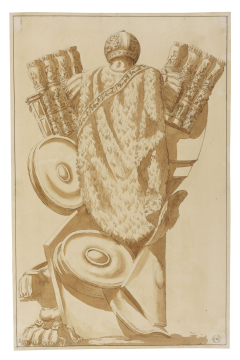 This is one of a set of four trophy drawings, Adam vol.26/89-92, all attributed to Antonio Zucchi (1726-95), probably all related to the Trophies of Marius from the balustrade of the Piazza del Campidoglio, Rome. The two Campidoglio trophies were moved there from the nymphaeum of the Aqua Giulia in 1590 (see E. Nash, Pictorial Dictionary of Ancient Rome, London, 1968, vol.II, p.125). They would be well known to James Adam from Giovanni Battista Piranesi's engravings in the Trofei di Ottaviano Augusto, 1753 (see G.B. Piranesi, Le Rovine del Castello dell'Acqua Giulia, 1761, pl.XVII) and in the Trofei itself, and later appeared in Robert Adam's work at Syon, Osterley and Newby (see D. Stillman, The Decorative Work of Robert Adam, London, 1966, p.64). This drawing may show the rear of the trophy in Adam vol.26/91. There were other forms of the trophy extant in Rome in the eighteenth century, such as those now in the Boboli Gardens in Florence, then in the Villa Medici. In addition, there were the trophy reliefs on Trajan's columns that were recorded by Charles-Louis Clérisseau (1721-1820) as 'différentes recherches sur les armes, le costume et les différentes instruments des anciens; ces différentes pièces sont puisés d'après des bas reliefs des statuës et des pientures antiques où d'après des desseins fort ancien et fort rare qui avoient été puisés dans la même source'. (For an account of the acquisition of this collection by Catherine II, see 'Un asyle glorieux' in Charles-Louis Clérisseau (1721-1820) Dessins du musée de l'Ermitage Saint-Petersbourg, catalogue of an exhibition held at the Musée du Louvre, Paris, 1995, p.66-72). There is another series of small trophy compositions in Adam vol.7/71, and panels based on the theme in Adam vol.19/98-99 by Giuseppe Manocchi (c.1731-82) of 1766, with similar compositions by him also of 1766 in album 5 of the Hardwick Drawings in the RIBA (see 5/28; see J. Lever, Catalogue of the Drawings Collection of the Royal Institute of British Architects, L-N, London, 1973).